After the first footage unspooled at this past year's New York Comic Con, fans finally got an official look at Spider-Man: Far from Home this morning with the first full trailer. And it arrived with a new one-sheet that teases the web-slinger's first adventure abroad. 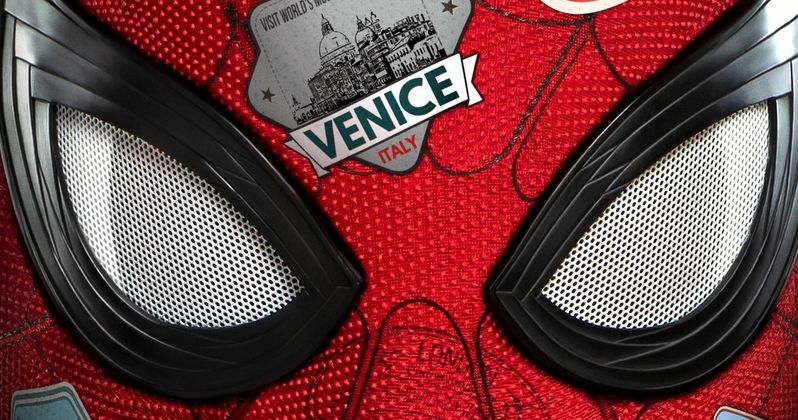 The poster plasters Spider-Man's mask with stickers from all the places he'll presumably be traveling to in Far from Home. Stuck right in the middle of his forehead is an iconic 'I Heart NY' sticker, giving us a sense of his hometown roots. But we also see that Parker will be heading to Prague, with a stop over in Berlin, and a trip to London. He'll also be swinging through Venice and the rest of Italy. The overseas trip apparently even has him visiting the Alps. The end of the trailer introduces us to the main villain Mysterio, played by Jake Gyllenhaal. The fishbowl wearing mystery man comes on like a hero at first, trying to protect Spider-Man from these elemental monsters tearing up the country side. But it's assumed that he has created these creatures himself, being a master illusionist. And he just doesn't want Parker in the way, exposing his true intent. Peter Parker is joined on his trip aboard by Samuel L. Jackson as Nick Fury, who looks to play a pretty substantial role in the adventure. Marvel boss Kevin Feige previously confirmed that the action in Far From Home all goes down after the events in Avengers: Endgame. But some fans think this may be a prequel leading up to Infinity War. That question hasn't necessarily been answered yet. But it appears that Spidey is back from the dust bowl and ready to fight another day. One interesting turn we see in the first footage is that there will be a lot of romantic antics going on. Not just with Peter Parker and his girlfriend MJ, but Happy Hogan and Aunt May seem to be hitting it off. We even learn that Aunt May has become a champion and supporter of Peter's work as the vigilante superhero Spider-Man, even urging him to take his suit on the school trip. Though Parker declines, deciding to be a kid instead. You can check out the new poster courtesy of Sony Pictures and Marvel Studios. It looks like Peter Parker is in for the trip of a lifetime.